NORMANDY- BAYEUX, HONFLEUR, ROUEN, and GIVERNY PHOTOS. PURCHASE GREAT MEMORIES OF YOUR VISIT TO NORMANDY - BAYEUX, ROUEN, HONFLEUR AND GIVERNY, FRANCE- FOR HOME OR OFFICE! This gallery features Normandy- emphasizing Bayeux, Honfleur, Rouen, and Giverny Photos. 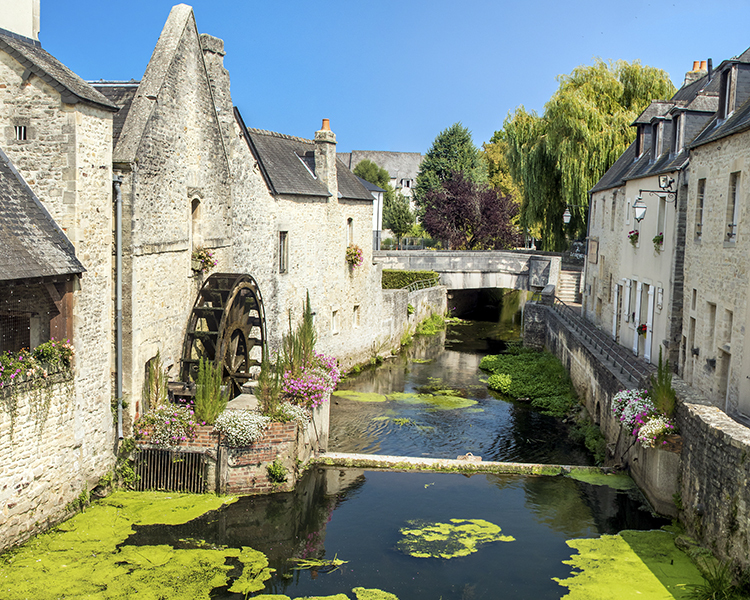 This charming town is about 160 miles (2.5 hour car drive via Autoroute) from Paris. It is an ideal base to use for visiting the D-Day battlefields and Mont Sainte Michel. The Bayeux Tapestry (photography not allowed), Bayeux Cathedral and Aure River walk. The Cathedral is magnificent, built in the 11th century, and is as big as Paris's Notre Dame Cathedral. There is a mixture of Romanesque and Gothic arches in the cathedral. Mont Sainte Michel is approximately 60 miles from Bayeux. Be sure to arrive early in the morning to catch a sunrise or stay late to view a sunset. Either way, arrive early to avoid crowds, even in the fall. It is 500 Feet from the entrance to top of church spire. The Abbey Church on top was built in the 11-12th Century and is a UNESCO World Heritage Site. As you climb 258 feet to the Abbey and Cloisters, stop and take views along the way. The well-fortified ramparts offer sublime views of the abbey and surrounding bay, and bridges. This gallery features the Abbey and pilgrims walking on the bay at low tide, the monk's dining hall, Abbey Church, statue of St. Michel, and a wheel used by prisoners to haul supplies into the Abbey. The prisoners were on the inside of the wheel- treadmill. Is a small French harbor town at the location where the Seine River meets the English Channel. It is about 65 miles from Bayeux. The old port, the Vieux Bassin, is colorful during the day and night. The Maisons Satie Museum is a must see. It features more than the story of musican Erik Satie, but his eccentric taste in art. The Cote de Grace walk offers magnificent views of the harbor, Normandy Bridge and Le Havre while the Jetty Park walk offers views of fishing vessels returning to port with their catch, the Seine River, and parks with colorful flower beds. There is a magnificent bed and breakfast, Le Fond de La Cour located within a ten minute walk to the Vieux Bassin and close to the Cote de Grace. Rouen is a 2000 year old city that is a mixture of Gothic cathedrals, half timbered houses, Joan of Arc's execution site, and the fifth largest port in France. It is 80 miles west of Paris and is murder to park in. If you drive, use a GPS. Rouen was invaded by Field Marshal Rommel before he became the desert fox in Libya. The Allied bombers destroyed half the city. Most of the historic city centre remained untouched (except the city hall). The Place du Vieux Marche is a pedesrian friendly area with shops, half timbered buildings, fish market, and the monument located at the site of the Joan of Arc execution. Other areas worth visiting are the Notre Dame Cathedral and Plague Cemetery. Built in the 12th century, this cathedral has numerous works of art inside. At night, there is a sound an light show that is magnificent featuring Normandy history and other topics. A must is having dinner in the oldest restaurant in France, La Cournne located near the Joan of Arc Monument and Cathedral. Opened in 1345, one can make reservations on the web (necessary on weekends). In 1949, Julia Child had her first French food at this restaurant. Giverny is approximately 59 miles west of Paris and is home to Claude Monet's maison and jardins. The gardens and maisons are living Monet paintings. Late summer at Giverny, France. Some of the photographs capture Monet's 1899-1915 paintings that merge water lily pads floating on the surface of the water with reflections of overhanging branches and grasses. These paintings were displayed at his water lilies studio at Giverny with some of his works displayed at the Orangerie. The boat in the foreground was included to celebrate Monet's paintings called "The Boat at Giverny" , and "In the Norwegian". Also, Monet had his gardener go out in a boat such as this one to weed the pond and keep the lilies in clusters. It also resulted in a glass like surface to capture reflections of trees, branches and shrubs. Monet had a fondness for painting sunflowers. SunFlowers, 1881 by Claude Monet is captured in several of the photos in this gallery. Monet painted the sunflowers with no sign of decay. Monet chose seven types of flowers for his still life works - sunflowers were among his most popular and this work accompanied five others to the Impressionist exhibition of 1882. The green shutters on the building past the trees is Monet's former family home and studio, donated by the family to the Academie des Beaux-Arts. Click on the link below for more details on visiting the Normandy area of France.